Heart failure (HF) is a clinical syndrome with symptoms and signs caused by cardiac dysfunction. Its prevalence is estimated at 1–2% in the developed world with an incidence approaching 5–10 per 1000 persons per year. Ischemic heart disease (IHD) is the most common cause of heart failure in the developed world. Heart failure due to ischaemia is associated with worse mortality compared with a non-ischaemic cause. The term ischaemic cardiomyopathy (ICM) has been commonly used to describe impaired left ventricular systolic dysfunction (LVSD: ejection fraction ≤35–40%) resulting from coronary artery disease (CAD). This chapter focuses on the diagnosis and management of ischemic cardiomyopathy. We explore the current evidence base to aid clinical decision-making for invasive versus conservative management. 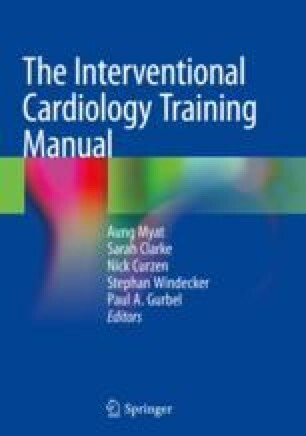 Conventional pharmacological therapy for heart failure will not be discussed in detail in this chapter. Freeman Hospital Services. [cited 2016 23 September]. http://www.newcastle-hospitals.org.uk/hospitals/freeman-hospital.aspx. REVIVED-BCIS-2 trial protocol [cited 2016 23 September]. NCT01920048. http://revived.lshtm.ac.uk.